A Russian Soyuz spacecraft glided to a smooth holiday docking with the International Space Station Friday, bringing three fresh crew members to the lab complex after a two-day orbital chase. Soyuz TMA-07M commander Roman Romanenko, assisted by Canadian flight engineer Chris Hadfield, monitored an automated approach to the station, ready to take over manual control if any problems developed. But the computer-controlled rendezvous went off without a hitch and the docking system in the nose of the spacecraft engaged its counterpart on the Rassvet module at 9:09 a.m. EST (GMT-5) as the two spacecraft sailed 250 miles above Kazakhstan. "Docking confirmed," said NASA commentator Rob Navias, relaying updates from the Russian mission control center near Moscow. "The Soyuz sleigh has pulled into port at the International Space Station with a holiday gift of three new crew members. 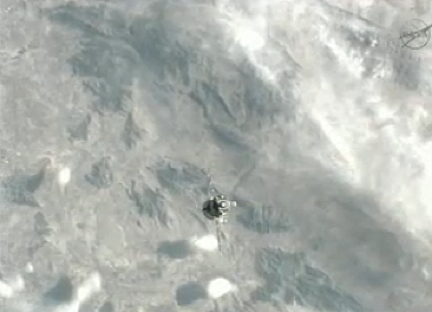 ... A picture-perfect rendezvous, approach and docking for the Soyuz spacecraft." Romanenko, a second-generation cosmonaut making his second trip to the space station, shuttle veteran Hadfield, making his third spaceflight, and NASA physician-astronaut Thomas Marshburn, making his second, blasted off from the Baikonur Cosmodrome in Kazakhstan on Wednesday, enjoying a problem-free climb to space to kick off a two-day rendezvous with the station. During final approach Friday, television views from the space station showed the Soyuz against the blue-and-white backdrop of Earth while a camera in the TMA-07M spacecraft showed the sprawling station against the black of deep space. 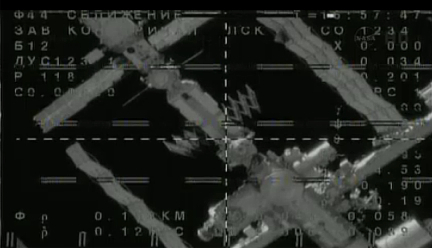 There were no problems and about 10 minutes after docking, hooks and latches fully engaged to pull the Soyuz firmly into place. After extensive leak checks, Romanenko, Hadfield and Marshburn planned to open the forward hatch and float into the space station, welcomed by Expedition 34 commander Kevin Ford and Russian cosmonauts Evgeny Tarelkin and Oleg Novitskiy, who were launched to the lab complex Oct. 23. Following a standard safety briefing, the crew will settle in for a relatively light schedule and a break for Christmas, complete with gifts and a holiday meal. A second break to celebrate the Russian Christmas holiday is planned for the first week in January. But soon enough, the pace will pick up with a busy schedule of scientific research, routine station maintenance, preparations for a Russian spacewalk and the arrival of Russian and European Space Agency cargo ships. Two commercially developed U.S. supply craft also are expected in March and April. Ford, Novitskiy and Tarelkin will return to Earth on March 15 aboard their Soyuz TMA-06M spacecraft. At that point, Hadfield will become commander of Expedition 35, the first Canadian to serve as leader of a space station expedition.